I remember a day in September, 2001, that shifted my world. I watched it unfold in front of me, two planes crashing into two towers, and all the pain and grief and disbelief that followed. I remember watching the Intrepid Junior Blogger, just two days before her second birthday, and thinking that even though she was far too young to realize it her world had forever been altered. I recall thinking about how she would never know a world free of the images of that terrorist act, and I knew (as I worked in the airline industry) that it would forever change air travel for me, and for her. The world had changed in both profound and subtle ways, and this change was not lost on me. Now, at the age of thirteen, that dark day in history is indeed history for her, a day she does not recall from memory but has rather read about in textbooks. Yesterday was another one of those days, but this time the IJB was old enough to watch it happen. She was in school, and the students shared the images and the stories as they occurred in real time. This will not be an event she learns about from textbooks. This is history that she has lived. I decided to not share the graphic images and videos here because I think we have all seen them. I don't think we need to see them anymore, and if you wish to view them they are easy to find because they are all over the internet today. I think we need to talk about something else, about making sense of the nonsensical, and about helpers. I was never really a Mr. Rogers girl, as the Canadian Mr. Dressup had my heart instead. But Mr. Rogers was right, and if you carefully study the photos from yesterday you can spot the helpers everywhere. I did that last night. I looked through all the graphic images and spotted the helpers, the ones in uniform and the ones who were not. There was one, a man comforting an injured woman. There was another, a woman helping someone to escape the scene of devastation. In almost every single image there was a helper, or more often several of them. And as I scrolled through the images, dozens of them, I realized these helpers were no different than you and I. And that is where Mr. Rogers was ever so slightly wrong. I don't think we should look for the helpers, you see. I think we should be them. This morning the IJB and I discussed how it is unlikely (but not impossible) that we will ever directly witness something like the terrorist attack in Boston. What we decided, though, is that even if we never do we can be the helpers. We can be the ones who help those in our own community, those perhaps suffering not from bomb blasts but from hunger or cold or fear or the other daily tragedies that occur in this world. We will not look for the helpers. We will be them. 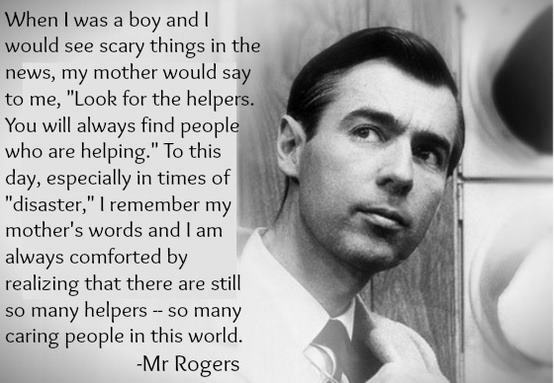 Every single person has the opportunity to be a helper, but not just at times of great tragedy like a sunny spring day in Boston. We have that opportunity right here in our own community. Yesterday we looked for the helpers - and today I hope we decide to be them.